Ken Kavanagh took over as Florida Gulf Coast's athletic director nearly five months ago and he's wasted little time influencing the program. The athletic department has taken over the operations and ticket sales for Alico Arena from the auxiliary services department and hired a consultant to help increase ticket sales and donations. In the next few days, the former Bradley athletic director also plans to hire a director of corporate sales and marketing. Kavanagh wanted to make these changes to increase revenue, streamline job duties and give associate AD/advancement Butch Perchan more time to spend with major donors. "The feeling is from the revenue side of it, everyone is under one umbrella," Kavanagh said. "This will help us continue relations with current fans and develop new strategies to build up new fan support." The new director of sales and marketing will be paid $45,000 and replace Jake Perkins. His position will include more sales than Perkins' did, Kavanagh said. For $1,500, Kavanagh brought in Matt DiFebo, who started a new strategic consulting firm that will focus on collegiate athletic ticket sales and revenue generation. Before that he was associate AD for external services at Central Florida, where he helped football season-ticket sales increase by more than 14,000. His ticket-sales model produced nearly $3 million in additional donations to the UCF Athletic Association, while he also led efforts to increase basketball and baseball revenues. Previously, DiFebo worked for the Seattle SuperSonics and Tampa Bay Rays. "He's an innovator," said Joe Hornstein, UCF's associate director of athletics. "We were moving into a new era and he crafted a plan. He wasn't just a ticket puncher. There was also a donor element, and there was a more personal relationship with the audience." After hearing DiFebo speak at an NCAA convention this summer in Orlando, Kavanagh asked him to visit Fort Myers. 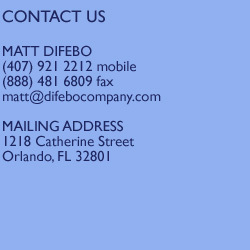 DiFebo's philosophy is that building a solid foundation in ticket sales can lead to group sales, merchandising and donations. He encourages athletic departments to hire full-time people with a background in sales or business rather than part-timers or volunteers. Those people then communicate regularly with team backers. "If you provide a personal connection, fans feel like they're connected to the program," DiFebo said. "If you get good feedback, we can get good information and implement policies or changes in the best interest of fans and the team. "By virtue of doing that, we build strong relationships with our fan base and have higher retention rates. That translates into more people in the stadiums and arenas." The athletic department oversaw the ticket office at every school Kavanaugh had worked at before FGCU; and with DiFebo's input, they encouraged FGCU president Wilson Bradshaw to go that route. "We will call and reach out to people who have come into our arena," Kavanagh said. "With first-time season ticket holders, we want to spend a great period of time getting to know them. It's our way of planting some seeds and watering the flowers." In his visit to FGCU, DiFebo was impressed with the school's foundation and athletic success. He also saw similarities with UCF. "They are both young programs hoping to grow," he said. "UCF did it in a fast rate. FGCU has a revenue-minded AD in Ken Kavanagh. He has a vision to grow FGCU into a top-notch program. "I also saw the potential in seasonal fans. While they're living down here, often times they look to support local schools and ways to get involved, not just in ticket sales but in fundraising. They have a level of disposable income." Part of FGCU's theme this year - 'Root For The Home Team' - is based on reaching seasonal visitors. "We understand fans have other teams they're cheering for," Kavanagh said. "I saw that in Peoria. Some of our good fans would wear orange when we played Illinois. We understand that. "Here, we hope they're wearing the green and blue most of the time."